Joey Gallo hit a three-run homer in the second inning and Delino DeShields had a two-run triple in a five-run sixth to help the Texas Rangers beat the Milwaukee Brewers 8-5 on Friday. Gallo, who hit 111 home runs in the minors and majors over the last three years, hit a shot more than 400 feet that bounced out of Maryvale Baseball Park. It came off Milwaukee starter Matt Garza, who walked the two batters in front of Gallo. "I'm switching up my approach and trying to be more patient than I was last year," said Gallo, who struck out 57 times in 108 at-bats after being called up by the Rangers. "I'm being what we call `patiently aggressive,' looking for a pitch in a spot and when I get it I can't miss it." 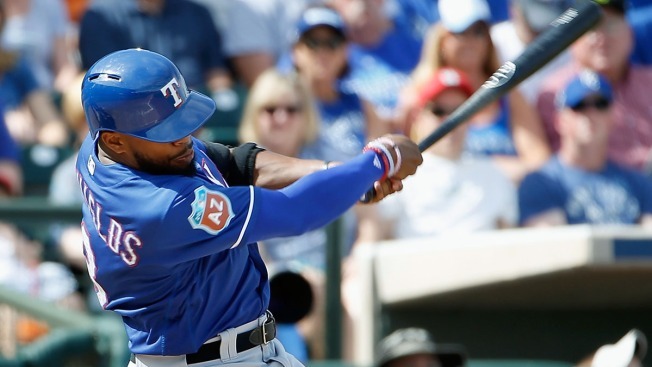 DeShields had two hits and raised his Cactus League average to .411 (7 for 17). Prince Fielder, in his first game back after taking part in a sleep study that revealed sleep apnea in Dallas, was hitless in two at-bats and committed an error at first. Domingo Santana had three hits, including a solo homer leading off the first for the Brewers. Santana, a prime candidate for the leadoff spot, is hitting .571 (8 for 14). "I've been (hitting leadoff) for a couple of games and I think I'm doing pretty good," said Santana, who has a .647 on-base percentage. "I'm getting on base, getting hits and doing what I need to do. I think I'm getting more fastballs and that's good. But I will be comfortable wherever they put me." Michael Reed also homered for Milwaukee, which had 11 hits. The Brewers have lost five straight after a 4-0-1 start. Rangers: Jeremy Guthrie allowed the leadoff home run to Santana but retired six of the other seven hitters he faced and likely helped his bid to become the No. 5 starter. "It's been 11 years since I've been in a situation like this," said Guthrie, who has allowed more home runs (245) than any other pitcher since 2007. "But if you look at things that way, you put too much pressure on things and it becomes less enjoyable. I believe in what I can do and more times than not in my career I've done what it takes to help the team win. Brewers: Garza breezed through the first before walking Mitch Moreland and Justin Ruggiano and falling behind to Gallo and challenging him with a fastball. "He's got a good swing, you know? But if I see him again, I'll break his bat," Garza said. "I'm not worried about it. He's a big boy. He hit the hell out of a high fastball on 2-0. So, next time, I'll get him." Keon Broxton helped his case to be the Brewers center fielder coming out of camp. He used his speed to turn a roller through the infield into a double in the third and made a tough fly ball in the gap look like an easy out on defense. He also nearly got to DeShields' triple in the sixth inning, racing to the wall in center and crashing into it on the catch attempt. "He's been impressive," Milwaukee manager Craig Counsell said. Rangers: Alex Claudio had a scare when Reed's line drive struck him on the right leg to end the eighth inning. Claudio collapsed to the ground but was able to walk off the field on his own and escaped with a bruise. Rangers: Right-hander Phil Klein will start against the Oakland A's at Surprise Stadium. Brewers: Right-hander Taylor Jungmann will start against the Colorado Rockies at Maryvale Ballpark.